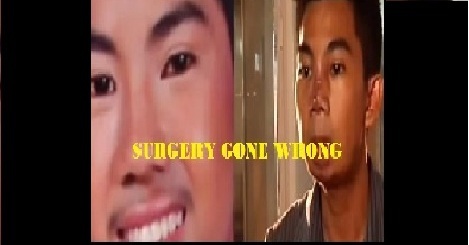 A man who wants to gain more good looks, decided to undergo a face surgery that turns to be a nightmare. Ellowe, who wants to sharpen his nose and to have a cleft chin. decided to go to Kashieca,a nurse recommended by his friend who knows something about in injecting collagen. He admit that he was scared at first, but eventually convinced to undergo the implanting collagen into his face. Ellowe, said to him by Kashieca, that the collagen will not cause infection. But after just two years, the fear of Ellowe was happen.in his nose and mouth are swelling and his face seem's to widen. My face grows bigger and widening after that I consult a doctor and said why is my face looks like this? The nose and mouth of Ellowe, suffered an infection and almost no trace of his former good looks. The cause of the damage of the face of Ellowe, is that collagen injected into the mouth and nose are not pure collagen. According to Dr. Gil Vicente, though it usually occurs when the body rejected the chemicals into the body that eventually destroy the skin. Investigative Documentaries, look for kashieca in Canlubang, Laguna. But never saw the anonymous nurse . Last year , Ellowe filed illegal practice of medicine in fiscal of Laguna against Lasheca because he gains complications . but as of now the case of fiscal against Kasheca are pending. Ellow, who only 16 years old that time is already participating in some talent search and due to his good looks he was able to seen in some movie and televison for minor role. But in order to pursue his career as actor he decided to take surgery to his face to looks more handsome but eventually turn to be the opposite. No Comment to " Good Looking Guy, Turns To An Ugly Guy After A Face Surgery Gone Wrong "